Greek lawyers are subject to law 4194/2013, a.k.a. the “Lawyers Code”, containing rules about Greek lawyers’ ethics, conduct, practice, disciplinary law, fees and advancement in status in general. Any Greek or European citizen holding a law degree from a Greek or a recognized foreign university may become a Greek lawyer, through registration with any Greek bar association. Greece has 63 bar associations and around 44,000 lawyers. Greek lawyers have to spend a period of 18 months as trainee lawyers under the supervision of an experienced lawyer, before taking the bar exam; upon successful completion of which they can be immediately registered with the bar association of their choice. Greek lawyers are no longer restricted as regards their area of practice since year 2010. Before that, Greek lawyers could only try cases before courts in the area of their bar association, otherwise requiring the support of a Greek lawyer practicing in the area that the court is located, if out of their bar-jurisdiction. After 2010, Greek lawyers may attend hearings before any Greek court without restriction. Upon registration with a bar, Greek lawyers are licensed to practice before the court of peace (competent to try cases of an amount up to € 20,000.00) or first instance courts (competent to try all other cases in the first instance). After 4 years of practice, Greek lawyers may apply to practice before the Appeal Court, while after another 4 years, a Greek lawyer may apply for practice before the Greek Supreme Courts (Arios Pagos – Greek Supreme Court for civil and criminal cases, Simvoulio tis Epikratias – Greece Supreme Court for administrative cases). A Greek lawyer may run his own office, work as a salaried or independent associate of another law firm or be a member of a Lawyer’s company. 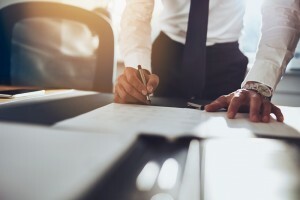 Lawyer companies in Greece are personal in nature, meaning that no capital contributions are necessary, while the partners have personal liability for all company debts. Lawyer companies may only be comprised of Greek lawyers or lawyers licensed to practice in another European country. Greek lawyer fees can be freely negotiated and agreed between the lawyer and the client. In the event that no such agreement has been made in writing, the Greek Lawyers Code provides for minimum payable fees for the lawyer’s services. The Greek Lawyers Code provides for professional sanctions for any professional violations. Such sanctions may range from a simple reprimand by a committee of the bar association, up to the revocation of the Greek lawyer’s license to practice. Lawyers’ clients that have reasons to believe that their lawyer has violated any rules Greek Lawyers Code, may address such lawyer’s bar association directly and file a complaint.